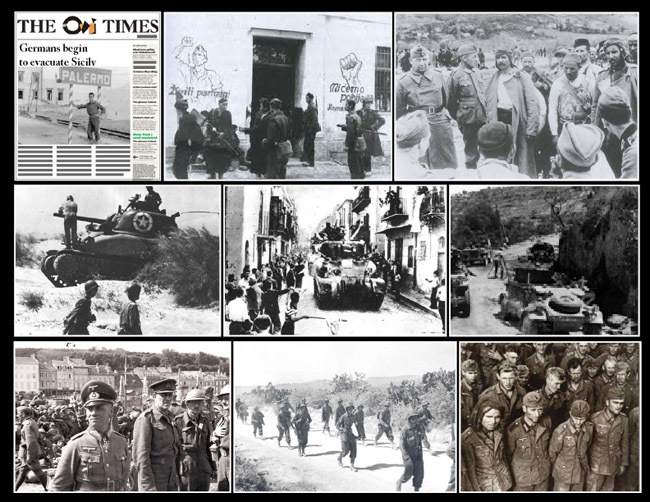 August 11th 1943, German forces begin a six-day evacuation of the Italian island of Sicily, having been beaten back by the Allies, who invaded the island in July. The Germans had maintained a presence in Sicily since the earliest days of the war. But with the arrival of Gen. George S. Patton and his 7th Army and Gen. Bernard Montgomery and his 8th Army, the Germans could no longer hold their position. The race began for the Strait of Messina, the 2-mile wide body of water that separated Sicily from the Italian mainland. The Germans needed to get out of Sicily and onto the Italian peninsula. While Patton had already reached his goal, Palermo, the Sicilian capital, on July 22 (to a hero's welcome, as the Sicilian people were more than happy to see an end to fascist rule), Montgomery, determined to head off the Germans at Messina, didn't make his goal in time. The German 29th Panzergrenadier Division and the 14th Panzer Corps were brought over from Africa for the sole purpose of slowing the Allies' progress and allowing the bulk of the German forces to get off the island. The delaying tactic succeeded. Despite the heavy bombing of railways leading to Messina, the Germans made it to the strait on August 11. Over six days and seven nights, the Germans led 39,569 soldiers, 47 tanks, 94 heavy guns, 9,605 vehicles, and more than 2,000 tons of ammunition onto the Italian mainland. (Not to mention the 60,000 Italian soldiers who were also evacuated, in order to elude capture by the Allies.) Although the United States and Britain had succeeded in conquering Sicily, the Germans were now reinforced and heavily supplied, making the race for Rome more problematic.